Double Negative, Image Engine Design, Instinctual VFX, ScanlineVFX, Soho VFX & Sony Pictures Imageworks worked on Visual Effects for Jason Statham’s The Meg. Double Negative worked on around 2000 shots for the movie. Adrian de Wet lead as overall VFX Supervisor. Image Engine delivered 147 shots across 10 sequences, which included a submarine launch and look development on the nautical depths witnessed beyond the submersible’s viewports. Image Engine’s key shot on The Meg sees a submarine dropped into the ocean, with the audience perspective set inside and looking outwards through a 360-degree spherical dome. This sequence necessitated a complex blend of water and light simulations, each meticulously designed to feel completely believable and sell the intensity of the scene. Image Engine has plenty of previous experience with water FX, with numerous sequences delivered on projects such as Independence Day: Resurgence, but the integration of surface fluids, submersed shots, and splash work in The Meg presented a new challenge. The team spent ample time on research and development, ensuring the effects of the submersible launch reflected the real-life physics of a large object interacting with a body of water. Crafting the perfect reaction required intense computing work. Simulating a full ocean view was deemed too time and resource-intensive for the shot, so the Image Engine team found a useful workaround that would deliver high quality results within the required timeframe. Upon making splashdown, the submarine descends to the depths hidden below the surface. Image Engine needed to generate the murky abyss encountered by Taylor and co, but with a twist: the view outside is presented not through glass or portholes but by an array of screens, each displaying footage from individual exterior cameras. To create that environment Image Engine needed to fathom out how light pierces down from the surface and how particles move in slowly shifting waters. Culpitt recalls one experience working with visual effects supervisor Adrian De Wet. Image Engine initially made temporary versions of some shots, delivering quick tracking of plates in Nuke of ocean particles and other effects. They were meant to help guide the process for separate, final shots, but De Wet was so impressed with the initial work that he encouraged the team to finalize those versions instead of starting anew. The studio’s work on this shot also exemplifies its collaborative approach to VFX. Image Engine worked closely alongside Double Negative, one of the primary vendors on The Meg, in bringing the scene’s assets to life. Indeed Steve Garrad, Double Negative visual effects producer, trusted the Image Engine team to provide their own take on work and even expand upon shared shots. Image Engine contributed additional work to numerous other sequences throughout The Meg. These included adding a CG boat extension to a partial set build in a water tank, and then adding CG water simulations interacting with the asset. Elsewhere, the team added CG water droplets to actors’ faces, and altered the look of screens to give them a reflective, iPad-like quality. Pouring effort into these shots, and delivering across numerous complex water simulations, has pushed the Image Engine pipeline even further. 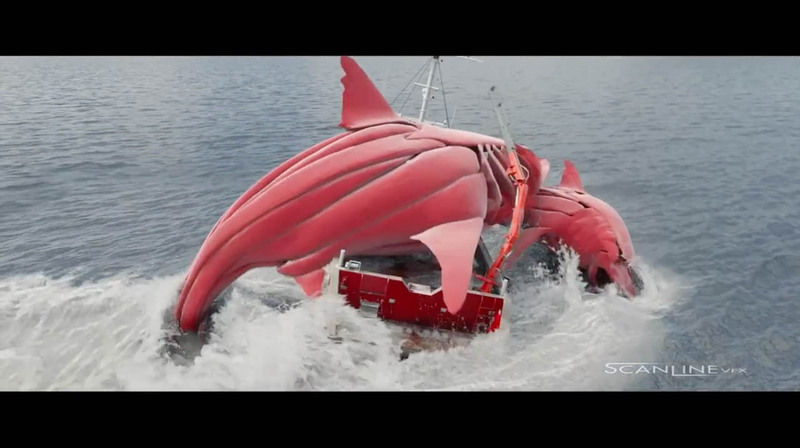 The R&D performed for The Meg further establishes the facility as one capable of delivering stunning FX alongside the creature work for which it is famously known. A team of 250 Artist at Vancouver and Munich offices at Scanline VFX delivered 482 shots for the movie. Team worked on multiple sequence including opening sequence of the deep ocean rescue mission, tagging sequence in which Jason swims away from the boat and tries to place a tracker on the Meg, spectacular chase sequence, Sanya Bay sequence. Sony Pictures Imageworks (SPI) worked on 300 shots for the movie.